When the Priors commissioned Teague to design their new mansion on four acres of woodlands, it was to be set well back from, but facing, Rockland Av, then known as Belcher St. 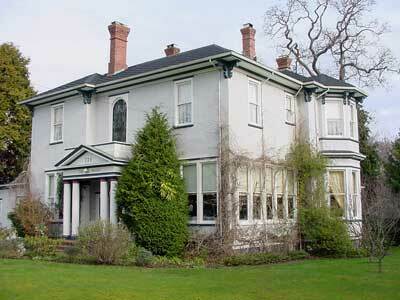 The Priory is a Victorian Italianate Villa which was later modified by Maclure. An engraving in West Shore magazine shows a two-storey house. A shallow hipped roof surrounds a flat roof with a large widow’s walk, giving commanding views all around. A narrow hip-roofed extension on the right façade has an octagonal bay on the lower floor. To its left is an elegant recessed porch with slim columns, scrollwork, and a pedimented hood under a balconet. In 1913 for $3,500, Maclure redesigned the right façade by extending the bay to two storeys, and enclosing and widening the porch area as a two-storey addition with a sunroom on the main floor. The main entrance, now centrally located, was moved around the corner to the left of the new addition. He added a Georgian Revival porch with Classical pedimented portico, double columns, pilasters, and a balconet above. An elaborate stained glass window is located above the balconet. Maclure also extended the eaves and replaced Teague’s brackets with more ornate ones. After the modernization, the house faced Pemberton Av. The house has been stuccoed. 1884-1913: Edward Gawler Prior (1853-1920) paid taxes on this property until at least 1916, but only lived here until 1913, and then moved to a new mansion at the top of St. Charles St hill known as Prior House (620 St. Charles St, Rockland). Born in Dallaghgill near Ripon, Yorkshire, ENG, Edward was educated at Leeds Grammar School and articled to J. Tolson White Engineering of Wakefield, Yorkshire. He arrived in Victoria in 1873 as assistant manager, engineer and surveyor for Vancouver Coal Mining & Land Co in Nanaimo. Five years later he came to Victoria as inspector of mines, and in 1878 he married Suzette Work (c.1855-1897), the youngest daughter of Victoria pioneer John Work of Hillside Farm, a chief factor of the HBC. Suzette died of cancer. In 1899 Edward married Victoria-born Genevieve Boucher Kennedy Wright (1863-1955) in Vancouver. In 1880 Edward entered the hardware business, first on Yates St with Alfred Fellows, who had opened the business with his brother Arthur in 1859, and took as a partner Francis Roscoe (1490 Fairfield Rd, Fairfield) in 1862. When the Fellows returned to England, Edward established E.G. Prior Co, now 606-614 Johnson St/ 1401 Government St, Downtown. After Edward’s death, the firm continued to grow, and in 1928, became McLennan, McFeeley & Prior, for decades the largest hardware company in BC. 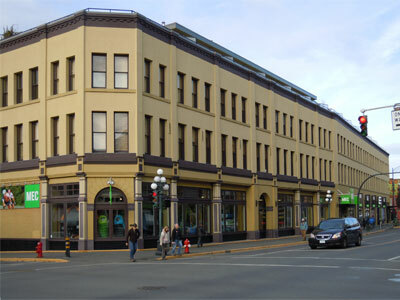 The building now houses Mountain Equipment Co-op at 1400-1480 Government St, Downtown. Col. Prior’s military career began in 1874 when he joined the Rifle Co in Nanaimo. He commanded Victoria’s Fifth Regiment, Canadian Artillery in 1888-96. In 1886 Edward Prior was elected MLA for Victoria. Two years later he resigned and entered federal politics. He was a Conservative MP for Victoria during the 1890s, and was appointed Minister of Inland Revenue. He was Minister of Mines in 1902-3, and was appointed Premier of BC for six months during this period. He was BC’s Lieutenant Governor from 1919 until his death in 1920. 1913-24: Herbert Payne Heming (b. Ontario 1864- 1932) and Elizabeth Aileen (b. Belfast, IRL 1869-1933) came to Victoria c.1907. Elizabeth came to Canada in 1883, likely to Ontario. Herbert was a timber broker. 1927-30: Widow Evelyn Every-Clayton (née Yeates, b. Dorset, England 1883-1961) ran a boarding house here. She married George Every-Clayton (c.1874-1927) in Vancouver in 1913. They lived near Courtenay, BC, for many years. George was found dead on Skirt Mountain in Langford, BC, in 1927. 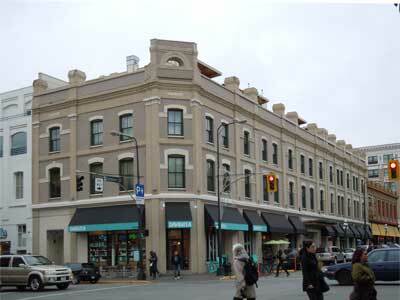 Evelyn later returned to the Courtenay area as a private nurse. 1931-74: William Lloyd Morgan (1894-1974) and Mary Ellen (née O’Brien, b. Spokane, WA 1896-1969). Mary came to Victoria at a young age, and attended St. Ann’s Academy (835 Humboldt St, Fairfield), Victoria High School (1260 Grant St, Fernwood), and the old Provincial Normal School in Saanich. She taught for a year at Willows School, then in 1917 married William, from a prominent Spokane family. During the 1930s she organized and wrote plays for the Priory Players and helped organize the Victoria Operatic Society. She was a founding member of the Craigdarroch Castle Preservation Society in 1959. Supporters of the Multiple Sclerosis Society, she and her husband opened their gardens to the physically challenged. During WWII Mary ran The Priory as a guesthouse. William sat on Victoria City Council for 10 years, chairing the finance committee. He and his wife were proprietors of a fuel company for many years. He lived at The Priory until his death..